On Aug, 10, 2015, 2 cosmonauts worked outside the International Space Station in orbit around Earth, seen far below. Yes, they do windows, even in space: Two cosmonauts scrubbed a window, documented the International Space Station exterior, collected an experiment and battled cold fingers during a speedy spacewalk Monday, August 10. The Russian residents of the space station are experienced spacewalkers: it was flight engineer Mikhail Kornienko's second spacewalk and Expedition 44 commander Gennady Padalka's 10th. Padalkla is the most experienced spacewalker in history, with over 35 hours under his belt — his first was in September 1998, when he repaired damaged cables on Russia's Mir space station. This was the 188th spacewalk of all station astronauts, which add up to 1,177 hours of spacewalking total (49 days). 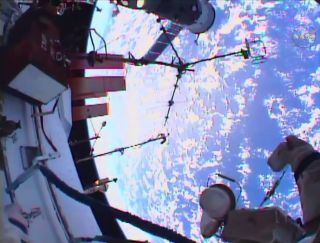 The spacewalk began at 10:20 am ET and stretched for 5 hours 31 minutes, an hour shorter than the scheduled mission time. While they were out, Scott Kelly and Kjell Lindgren of NASA, along with Kimiya Yui of the Japanese Aerospace Exploration Agency, sampled NASA's very first space-grown produce. On Aug, 10, 2015, 2 cosmonauts worked outside the International Space Station (bottom of image) in orbit around Earth. Mikhail Kornienko works outside the International Space Station on the August 10 spacewalk. Throughout the spacewalk, they photographed the outside of the Russian module to check for wear and tear near the thrusters, and they took the opportunity to grab panoramic shots of Earth — identifying Australia, and seeing the city Brisbane beneath them just as they dropped out of communication for a few minutes as they switched between communications satellites. Later, the duo retrieved a 2013 experiment, called the Obstanovka Experiment, which investigated how the superheated gas from space affected the ISS hull. On Aug. 10, 2015, a cosmonaut floats (upside down just below and left of center) outside the International Space Station during Russian EVA 41. The cosmonauts also cut free an old communications antenna, WALL 6, which they held onto to jettison near the end of the flight. Later, as Kornienko adjusted the orientation of a module investigating thruster plumes, Padalka posed in front of a viewport for the astronauts inside to photograph, and even filmed from the outside looking in. Finally, the two cosmonauts headed inside the hatch, where they'd stay as they slowly repressurized. Padalka took a moment during Earth sunrise, now that the orientation was right, to hurl the disconnected antenna away from the station into space — it joined two towels, used to dry off the cosmonauts' suits at the beginning of the mission. On Aug. 10, 2015, 2 cosmonauts completed Russian EVA 41 outside the International Space Station. Cosmonaut Mikhail Kornienko is seen inside the hatch (at left), while the hands of cosmonaut Gennady Padalka have just jettisoned an old cable. "I've never seen anything this isolated," one cosmonaut said as they were closed inside once again. "It's like a tiny tin can." As they were sealed in, there was just one response to the last glimpse of space: "What a view. Spectacular."